The Class and Component prices for June were released on July 1. 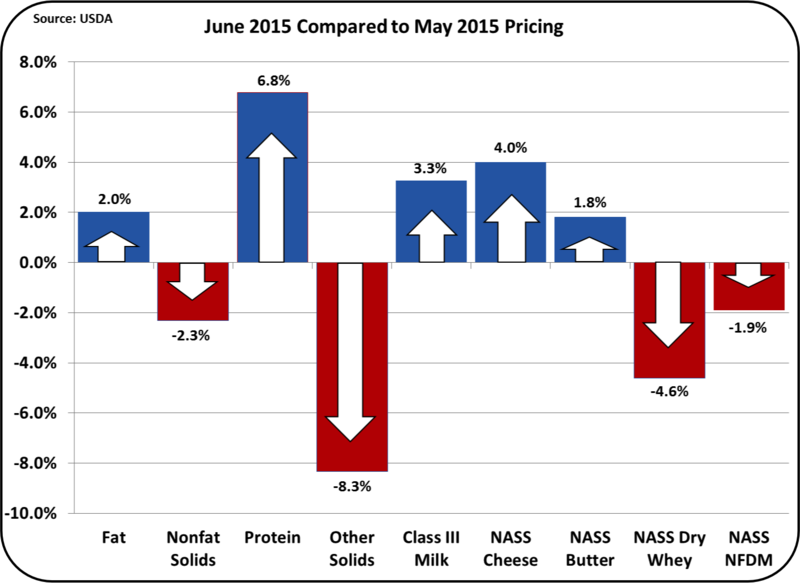 Class III milk was up 3.3% on an increase of 4% in cheese prices. The June Class III milk price was calculated at $16.72/cwt. This appears to be the new norm as compared to the 2014 prices which, were typically in the $21 to $24/cwt. range. 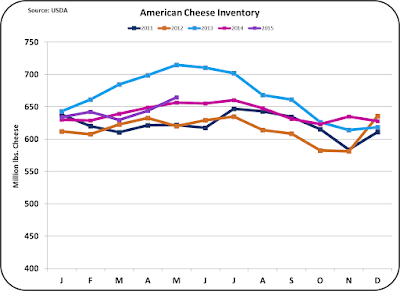 The remainder of this post will be devoted to an analysis of cheese pricing, production, and inventories. 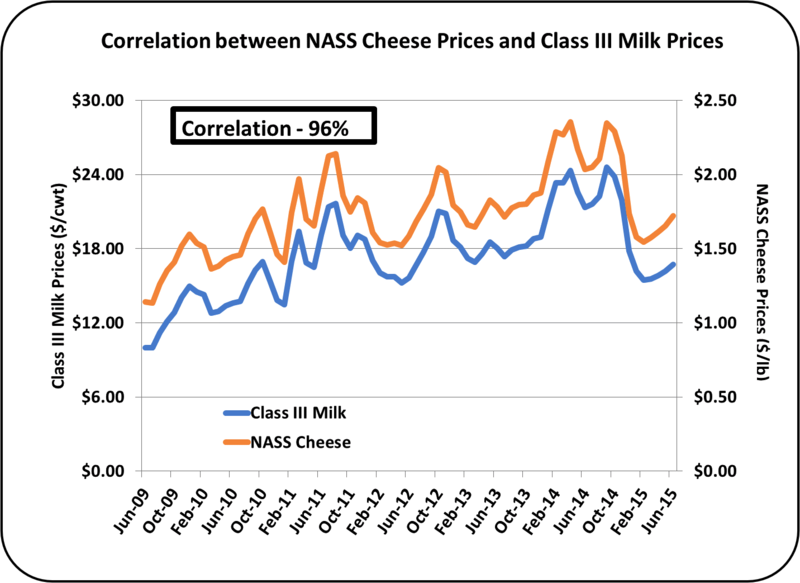 As analyzed in the April 23, 2009 post to this blog and cited numerous times in prior posts, the price of Class III milk is tightly tied to the wholesale price of cheese as determined by NASS. The correlation is shown below. 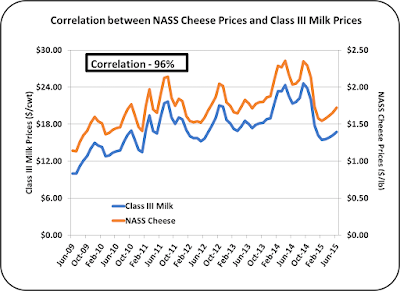 The price of Class III milk can be predicted with 96% accuracy based on the price of cheese. Domestic consumption of cheese accounts for 93% of cheese production, with the remaining 7% is exported. Therefore, continued growth in domestic consumption is very important to maintaining a balance between supply and demand. The following charts and explanations in this section address domestic consumption. Cheese consumption is influenced by the price of cheese. When the prices are higher, consumption slows. 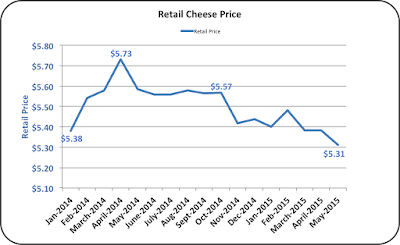 The run-up in cheese prices in 2014 did influence cheese prices, and if the higher prices were sustained, they could have negatively influenced demand. Lower demand would bloat inventories causing a bubble that must then be burst by reduced production and lower prices over a long period of time. In that sense, the current lower prices for cheese are stimulating demand and consumption, allowing for continued growth in domestic consumption. This allow production to maintain volume and still keep inventories in line. The charts and explanations below provide an analysis and understanding of these forces. 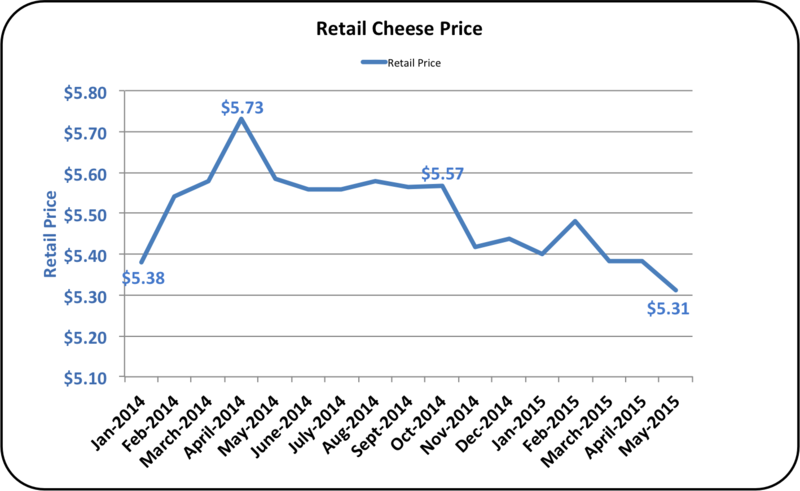 The retail price of cheese has fallen from a high of $5.73/lb. in 2014 and is currently at $5.31/lb., which is a drop of $.42/lb. 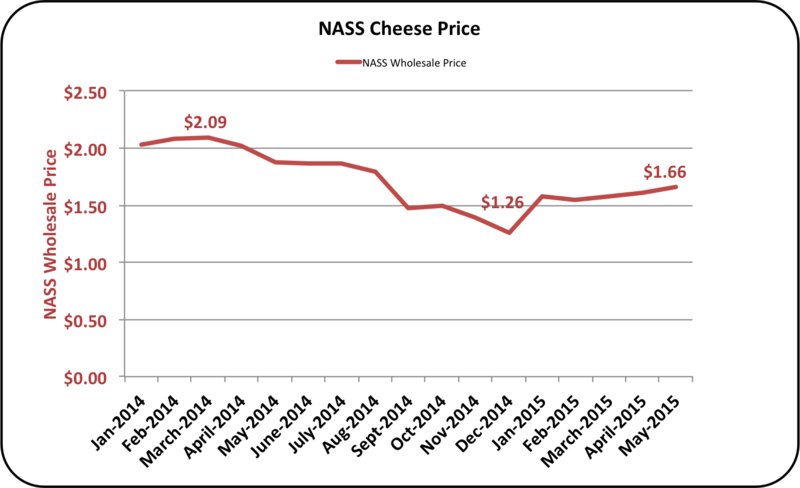 This is almost exactly the drop in the wholesale price of cheese quoted above for a similar period. Cheese consumption is subject to price elasticity of demand as mentioned above. The high prices attained in 2014 could have impacted retail pricing and dampened demand. However, at the current retail prices, consumption should be stable or rising. 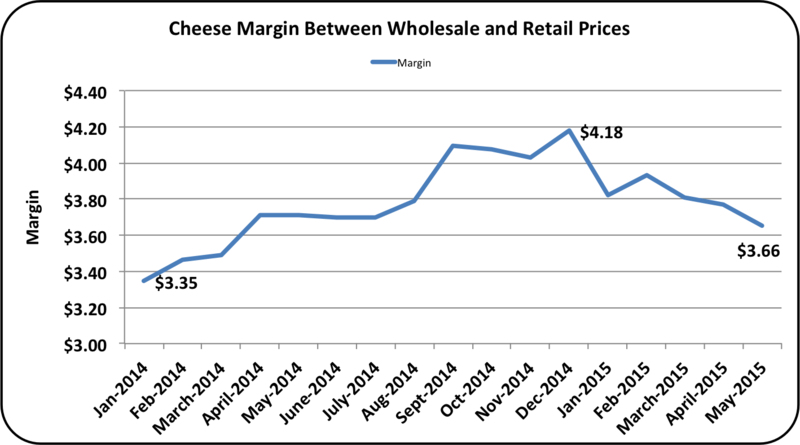 The final part of the equation is the margin between the wholesale and retail price of cheese. 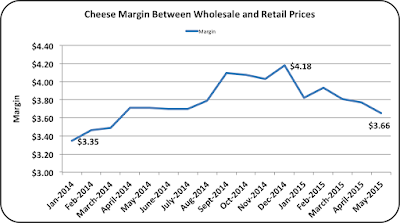 During this 2014/15 period of time, the margin between wholesale and retail has fluctuated by $.82/lb. Currently the margin is midway between its peak and low for this period of time, and has a downward trend. The margin is adequate to cover the costs of packaging, distribution, and sale of cheese and therefore there is no upward margin pressure on the retail price of cheese. All of the above charts on cheese pricing show nothing that would force the retail price of cheese up, reducing consumption. 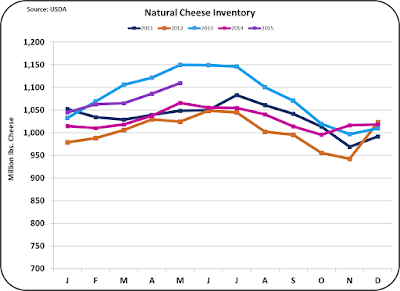 The indicators show a near term environment where domestic cheese consumption will continue to grow. How much further can they grow? By the standards of some European countries, per capita consumption still has plenty of room to grow. 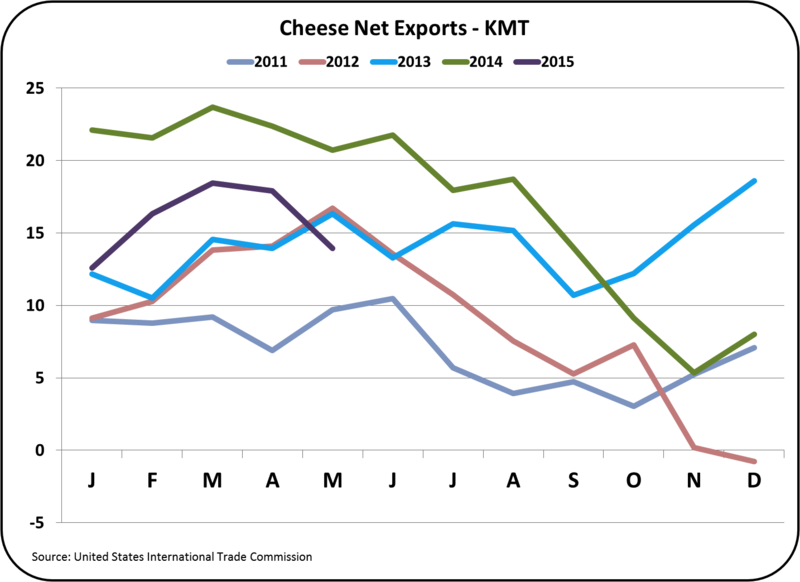 Exports of cheese remain near record levels. Exports YTD account for 7% of cheese production. This is down slightly from the 8% level of a year ago, but are still maintaining a healthy export volume with good opportunity for growth. Due to the significant reductions in dairy purchases from China and Russia, there is an excess of dairy products available in the international markets. As stated in the May 10, 2015 post to this blog, cheese exports do have some brand awareness that makes them less of a commodity than other dairy exports like nonfat dry milk and dry whey. 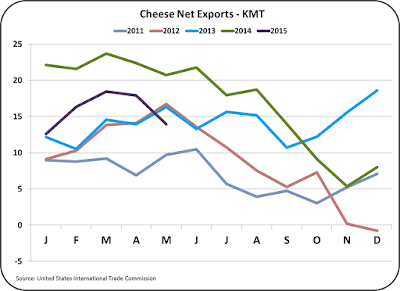 The international excesses have reduced export prices, and the May data indicates some weakness in cheese exports. While the chart below in troubling, the significant downturn is only one month. Cheese exports will continue to be followed closely in the blog. 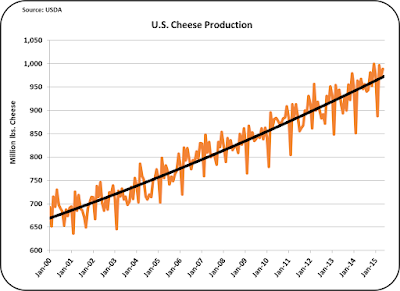 Cheese production has a long history of growth without any significant declines. The graph below shows the history since the beginning of 2000, but the history of growth in cheese consumption goes back much further. 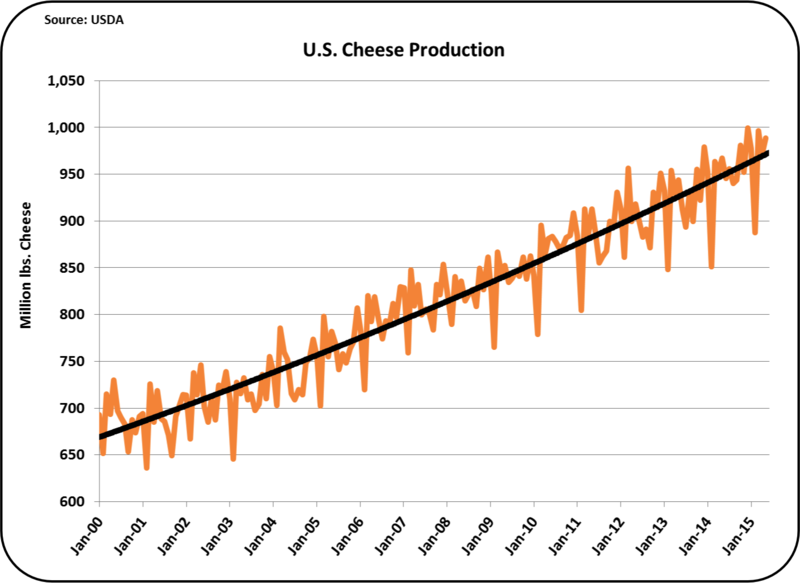 In the last five years, the U.S. growth of cheese production has also increased with growing cheese exports. Capacity is being added continuously to meet the current and anticipated future demand. 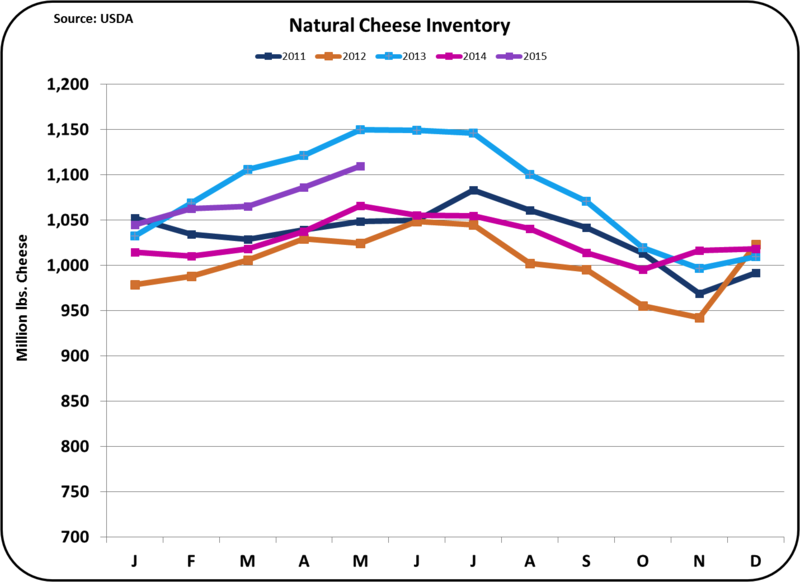 Demand is being met with the current level of production and the growth is being absorbed by domestic consumption and exports as evidenced in the analysis of cheese inventories below. 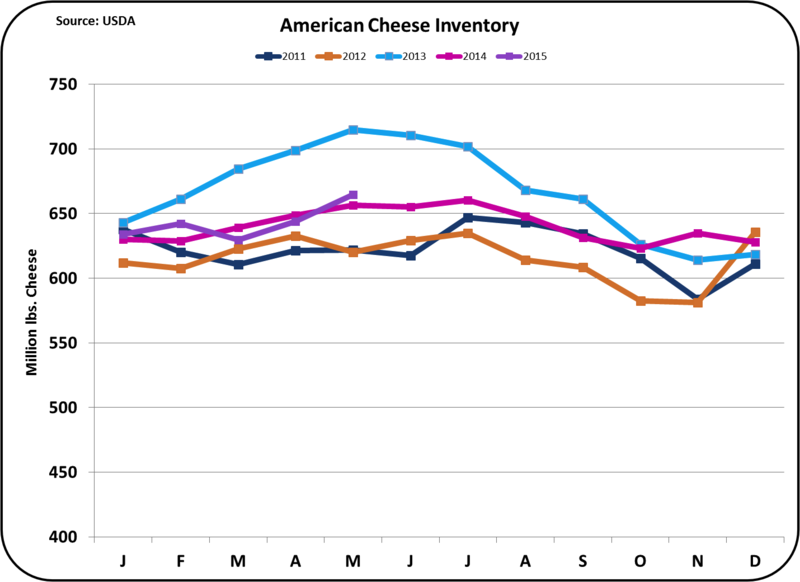 Importantly, cheese inventories remain in balance. They are higher than the prior year, but production and disappearance are also up, so a small increase in inventories would be expected with the increases in overall volume. Currently, there is no pressure for lower prices resulting from high inventories. The only concern is the fear of coming high inventories from reduced exports. This fear has played into the volatility in cheese prices and this volatility has been transferred into the Class III milk price. While cheese is only 7% exported, compared to exports hovering around 50% for nonfat dry milk and dry whey, the international markets are influencing cheese prices by creating fear of distortions in cheese disappearance caused by international events. The very important cheese market appears to be in balance. Pricing, domestic consumption, exports, and inventories are in balance. 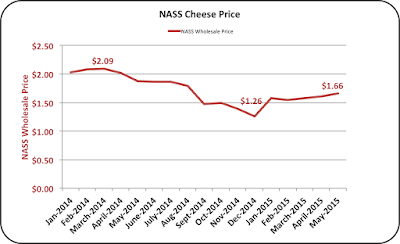 The futures market is showing very slight positive upward movement in cheese prices. By these measures, cheese prices and there Class III milk prices will remain near the current levels for the foreseeable future. Hi, I have read your post that is an excellent post. You shared nice points and best concept. I like your post and way which you shared and blog as well. In your blog there is nice information and nice concepts. Thanks for share with us nice information.